The nation continues to grapple with the fallout from this weekend’s violence after a Nazi sympathizer drove into a crowd of anti-racist protesters in Charlottesville, Virginia, killing one person and injuring 19. Donald Trump finally condemned white supremacists on Monday for the bloodshed this weekend, after initially failing to directly blame the group. The nation continues to grapple with the fallout from this weekend’s violence after a Nazi sympathizer drove into a crowd of anti-racist protesters in Charlottesville, Virginia, killing one person and injuring 19. Donald Trump finally condemned white supremacists on Monday for the bloodshed this weekend, after initially failing to directly blame the group. The move followed mounting pressure and severe backlash from nationwide street protests and corporate CEOs who resigned from Trump’s American Manufacturing Council over his failure to quickly condemn the deadly violence. Meanwhile, a Foreign Policy report revealed that an FBI and Department of Homeland Security bulletin concluded that white supremacist groups were responsible for more homicides “than any other domestic extremist movement.” Despite these findings, the Trump administration recently slashed funds to organizations dedicated to fighting right-wing violence. 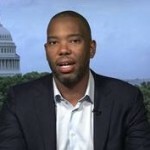 Award-winning acclaimed author Ta-Nehisi Coates takes part in his first major interview since the inauguration of Donald Trump. Attorney General Jeff Sessions, who is himself named after Confederate leaders, is now tasked with investigating the white supremacist violence in Charlottesville, Virginia, which killed one person and injured dozens. But few have any confidence this investigation will bring justice, given Sessions himself has a long history of making racist comments and defending white supremacist policies. The violence is escalating calls for Trump’s resignation, including from Ta-Nehisi Coates. The white supremacist violence in Charlottesville, Virginia, over the weekend came after thousands of neo-Nazis, Ku Klux Klan members and other white nationalists descended on Charlottesville to protest the city’s plan to remove a Confederate statue of Robert E. Lee. The effort to remove this statue was spurred in part by the African-American city Vice-Mayor Wes Bellamy, who convinced his fellow city councilmembers not only to vote to remove the statue, but also to create a “reparations fund” for Charlottesville’s African-American residents.